BarWinners books and materials are the best in the field! Creator of BarWinners, Professor Shari Karney, Esq. has devoted the last 30 years of her life writing and editing the BarWinners’ books and materials. BarWinners is proud to offer these to you to with as an integral part of every BarWinners California bar review course. Everything you need to pass the essays contained in ONE, BAR-READY, CONDENSED, EASY TO MEMORIZE and USE, APPROACH BOOK. This incredible book lays out for you, a substantive law approach for all 14 tested substantive subjects tested on the California Bar in the same way you will write that issue on the actual Bar Exam. Remember, the California Bar Exam is a standardized test. The Bar graders take only 1-2 minutes to grade each essay. We give you the headings, sub headings, rules of law, and steps for each Bar tested issue and area of law. BarWinners Bar Review gives you suggested pre-written language to use on the actual bar exam. BarWinners Books and Materials are the best in the field. The Question and Answer Books Vol. I and II cover the issues and areas of the law that are heavily tested by the California Bar Examiners as well as potential “surprise” issues and CROSSOVERS. 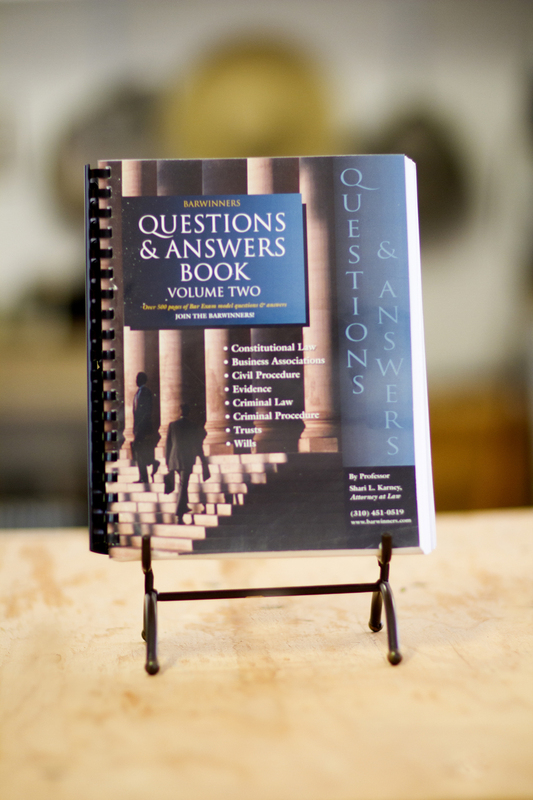 The Question and Answer books contain past bar exam essay questions for every area and subject tested on the bar. All the Suggested Released California Bar Exam answers used in these volumes have received a score of at least a 75-80 from the California Bar Examiners. Simulated Essay Exam questions, as well as  BarWinners  model answer  and cut sheets for each essay question. We show you how to apply the law that you have learned to essays. How to analyze each fact pattern and how to write a passing answer. We have carefully reviewed all the questions and answers the California Bar has given over the years, and hand-selected the best questions to prepare you to pass YOUR Bar Exam. BarWinners Performance Test workbook has templates on how to organize and respond to the most commonly tested “Task Memo’s” asked on the California Bar Exam Performance Test. 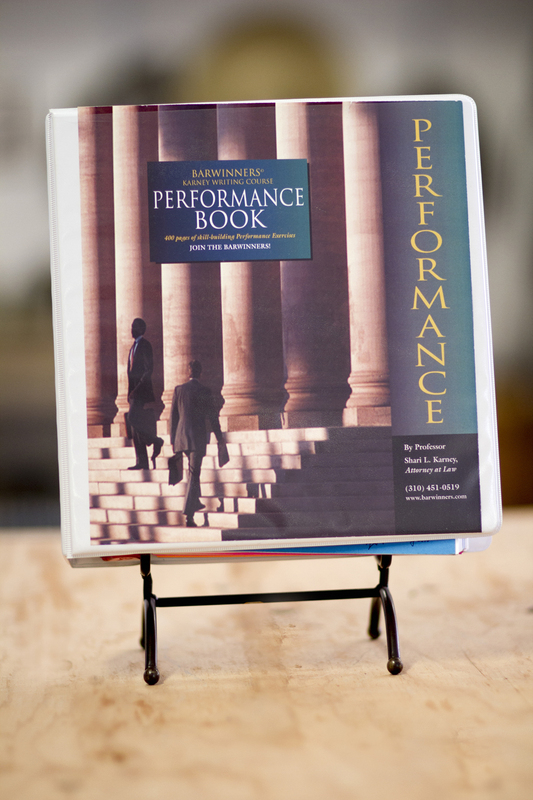 BarWinners Workbook is designed for the new 1.5 hour Performance Test format. 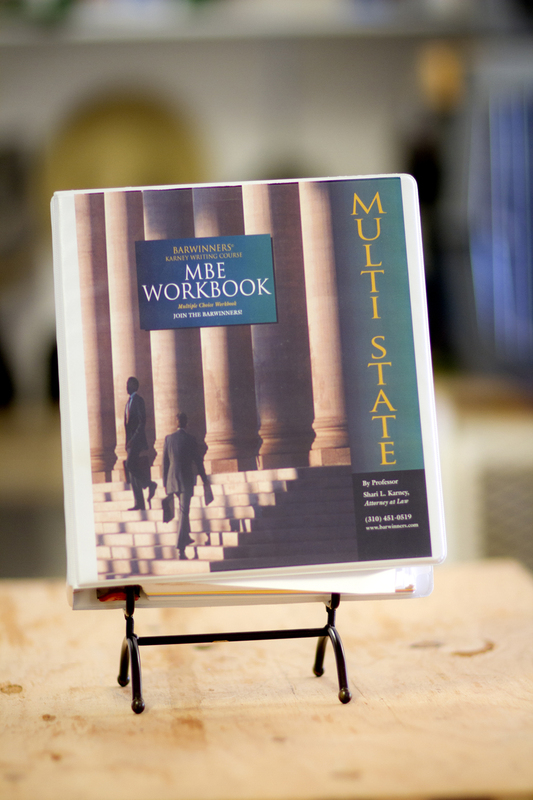 BarWinners’ MBE Workbook is designed to prepare you for the Multistate Bar Exam (“MBE”). Formidable, efficient, practice questions with full explanations, 15 hours of simulated exams, and pages of substantive review materials. This is an entire MBE system for taking and scoring high on the MBE. Each section of BarWinners’ MBE Workbook, gives you questions and explanations building up to Simulated MBE practice exams. Our system is a logical study system for mastering the multistate bar exam material. 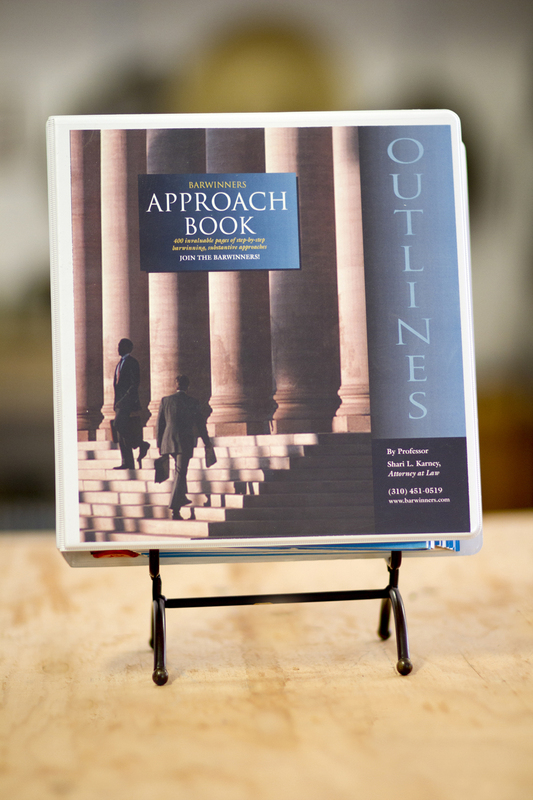 Unlike some traditional methods, our Workbook builds your knowledge and confidence in practical and reasonable steps. Key terms and concepts are defined and explained.